This site, on Alaska's principal highways, is under development. I conducted some "field research" while on vacation in Alaska in late June and early July 2001, late July and early August 2007, June 2009, and July 2012, among other things to take more road photos to supplement and update the ones I took on my 1994 road trip to Alaska. I'll flesh out this site as time permits. UPDATED! One part of this site already completed is an Alaska Interstate ends photo page. ("What Alaska Interstates?!" you may ask. Yes, there are four of them on paper, even though there are only a few miles of Interstate-grade freeway, and it's unlikely there will be much more freeway in Alaska anytime soon. When this site is further along, I'll try to explain this mystery.) NEW! In addition, I have added photos of about half of Alaska's state route ends. UPDATED AND EXPANDED! Also here is the Dalton Highway Photo Journey, a three-page collection of photos (the majority of them are my own, from a 1994 tour) of the rugged and lonely Alaska route 11 to the Arctic Coast, the northernmost highway in North America. This is an expanded and updated version of the pages originally co-authored and hosted by Andy Field as part of one of his sites. Many more photos from other Alaska roads will eventually make their way onto this site. 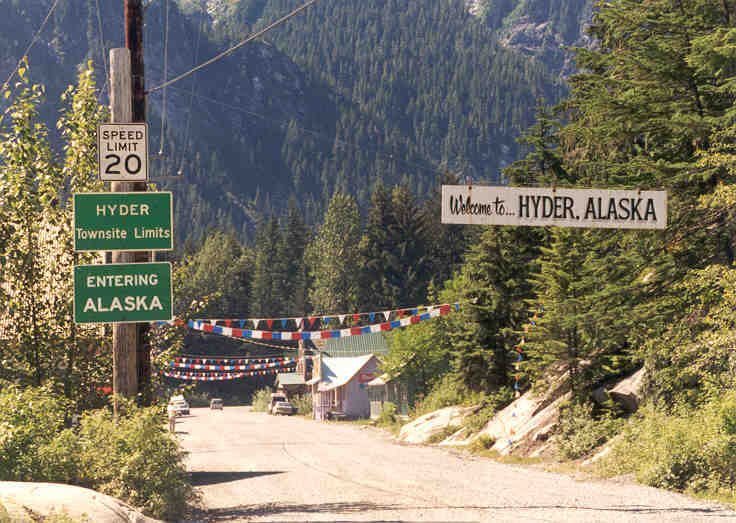 In addition, there are about a dozen photos from my 2001 vacation, covering the access road to the port of Whittier, and especially the unusual 2.5-mile one-lane tunnel shared by both directions of auto traffic and Alaska Railroad trains (longest road tunnel in North America). 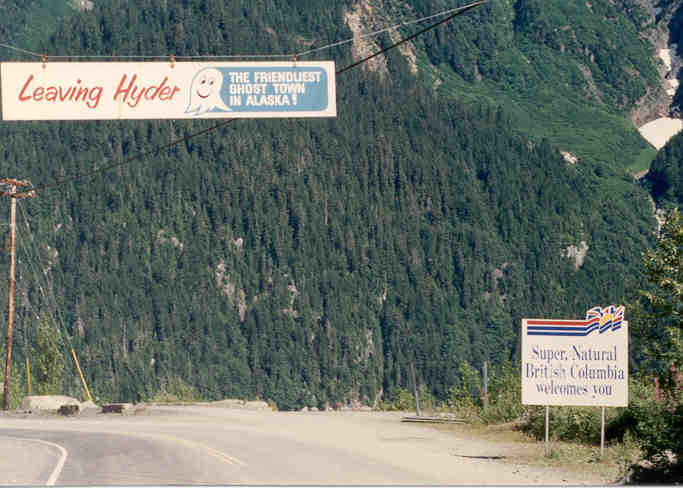 For a few miscellaneous photos from my 1994 vacation, see some photos of the then-unguarded border crossing at the isolated ghost town Hyder in the southeastern corner of the state (entering Hyder from Canada, and crossing back into Canada). NEW! 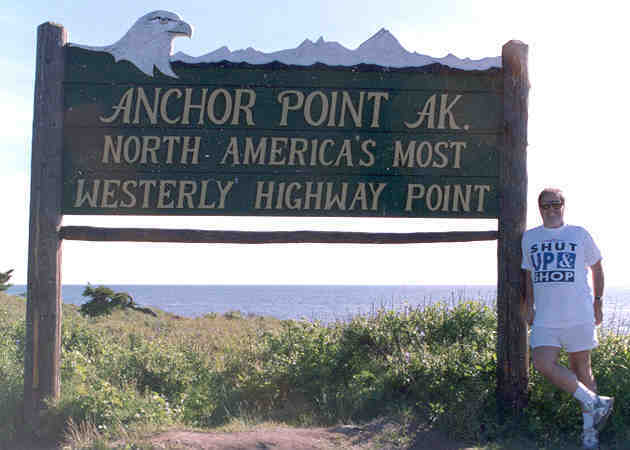 There's also one of me in 1994 at Anchor Point AK, at the self-proclaimed westernmost point on the continuous North American highway system. While that's true if you don't count the Alaska Marine Highway auto ferry system, if you do (as I would), the real "westernmost point" is in the Aleutians, specifically in Unalaska at the west end of Captains Bay Road. A photo of that, and road photos from elsewhere in Unalaska, from my July 2007 visit there are at my new Unalaska (Dutch Harbor) road photos page. NEW! Also from later that trip are a few road photos from the other side of the state, the small and isolated road network of Yakutat (near where the southeastern panhandle connects to the rest of Alaska). PHOTO ADDED! I also offer, as a Christmas treat, a small collection of photos featuring Fairbank's Christmas-themed suburb of North Pole. Also, take a look at the exit lists for Alaska's three freeways (all in the Anchorage area). UPDATED AND EXPANDED! There's also photos of the historic Million Dollar Bridge taken both before and after repairs of the damage from the 1964 Good Friday earthquake. In the meantime, please consult the annual publication The Milepost (available in most bookstores), a very comprehensive guide to the principal roads of Alaska and the Canadian Arctic, including extremely detailed listings of the sights and services available along those roads, and also lots of photos. Also, Alaska's state Department of Transportation and Public Facilities has an extensive web site with highway and other transportation information. For some other web sites on Alaska roads, James Teresco's road signs site site includes many road photos from his own 2001 road trip to Alaska, including some roads I didn't cover (the most interesting photos include an Alaska US 97 shield he found in a Fairbanks museum). Also, Steve Alpert has several pages with photos and other observations from his own travels in Alaska in summer 2004. Because The Milepost covers the territory so well, I will not attempt to outdo it, or to provide a level of coverage comparable to my extensive Hawaii Highways site. I will provide some basic route lists similar to those usually found on highways web sites (including information, completely irrelevant to most travelers and therefore not covered in The Milepost, on the paper network of Interstate routes in Alaska, as well as some historical information on Alaska's state route system). I will also have a Frequently Asked Questions section covering such topics as when there will be real Interstates in Alaska (my quick guess, not in my lifetime); the Alaska Marine Highway ferry system that connects communities in southern Alaska isolated from the regular road system; and the aggravations of road construction and maintenance in permafrost country. Finally, as with the Hawaii Highways site, there will be lots of road photos. Please e-mail me if you have any questions, comments, etc. For a separate collection of road photos from some other cool northern places on the other side of North America, from my vacation there in August 2003, see my three-page Newfoundland/Maritimes road photos collection. © 1994, 2001-07, 2018 Oscar Voss. Last updated May 2018 (major updates and expansions of Dalton Highway and Million Dollar Bridge collections).